We did this last year and oh lord was it bad. So, naturally, we’re going to do it again. Please enjoy yet another staff prediction extravaganza from Brandon Vogel, Erin Sorensen, Greg Smith, Jacob Padilla and Derek Peterson. How many wins will Nebraska have in 2018? BV: I’ve been bouncing back and forth between 7-5 or 8-4. The latter would effectively require no slip-ups by Nebraska, but wouldn’t, in my mind, require any massive upsets. 8-4 it is. ES: I’ve been saying 6-6 all along, and I’m staying there. Maybe 7-5? This year I’d rather be wrong for shooting too low on my expectations versus shooting too high like last year. GS: Somewhere along the way this summer, I ended up at 8 wins. I’m going to stick there and say Nebraska goes 8-4. JP: 7-5 during the regular season is what I’ve been thinking throughout camp and I’m going to stick with that. I’ll give them a bowl game win as well. Doubling Nebraska’s win total in year one wouldn’t be too shabby of a start for Scott Frost in Lincoln. DP: I’ve said 6-6 pretty much all offseason because of the schedule. At Wisconsin, at Northwestern and at Ohio State in a four-week stretch. It’s just brutal. That being said, I’ll buy some of the stuff Scott Frost is selling and move to 7-5; I think they’ll enter the last two games of the season 6-4. The big four games this season are: at Michigan (Sept. 22), at Wisconsin (Oct. 6), at Ohio State (Nov. 3) and vs. Michigan State (Nov. 17). What will the Huskers’ record be against those four opponents? BV: 1-3. Nebraska will win the home game and it won’t be an upset. ES: 1-3, and I’m between Michigan and Michigan State on which one is the win. I’m going to take Michigan only because the Big Ten will explode if Scott Frost defeats Jim Harbaugh in Year 1. GS: 1-3 but the one will not be against Michigan State. JP: 1-3 with a win over Michigan State. DP: 1-3. The one will not be Michigan State. It’ll be the other Michigan school. How many games will the Huskers be favored in during head coach Scott Frost’s first season? BV: Seven. The Huskers will be dogs to Michigan, Wisconsin, Northwestern (for now), Ohio State and Iowa. ES: Seven. I’ll take Akron, Colorado, Troy, Purdue, Northwestern, Minnesota and Illinois. GS: Eight. I have the Huskers as underdogs to Michigan, Wisconsin, Ohio State and Michigan State. JP: I’ll say they’re favored against Akron, Colorado, Troy, Purdue, Northwestern, Minnesota and Illinois. That makes seven. DP: I’ll go seven, same as Brandon. They’ll be underdogs against Michigan, Wisconsin, Northwestern, Ohio State, Michigan State and Iowa. Of all the ones that could change, Iowa feels like the most likely choice. Who will be the team’s leading tackler? BV: Inside linebackers led UCF a year ago, but with so many options there for the Huskers divvying up the numbers, I’ll go with Luke Gifford. ES: I’ll take Luke Gifford. GS: I’m going to go with Dedrick Young for a bounceback season. JP: Central Florida’s top three tacklers were linebackers last season with Tre Neal coming in at fourth with 68. Their top two tacklers were inside ‘backers with Shaquem Griffin at No. 3 (30 tackles behind No. 1, Pat Jasinski). So it stands to reason that an inside linebacker would be the best bet here. However, which one? Considering both spots include an OR on the week one depth chart, I’ll go with Luke Gifford. I get the feeling that as long as he stays healthy, they’re not going to be able to take him off the field. DP: Mohamed Barry. He’s going to have a big season. Not sure how many times I’ve said that this offseason but here’s to another just because. Which unit will have the better bounce-back year in 2018: the secondary or the offensive line? BV: Secondary. 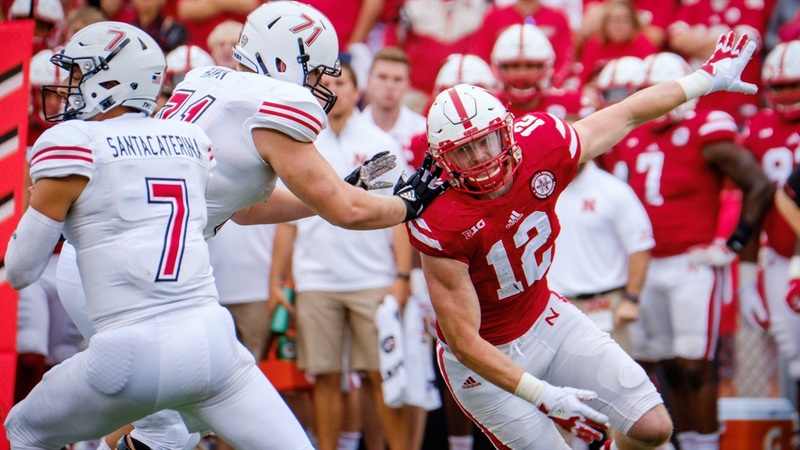 I still think Nebraska has ample talent there –– particularly after the additions this offseason –– and a new mindset should do wonders. ES: Secondary, for sure. I think the offensive line still has a lot of kinks to work out, and the depth there is very concerning. GS: I’ll say the secondary. I predict that a cornerback will have an interception this season unlike last year. JP: I think both will be significantly improved in 2018, but in my opinion, the secondary was even worse than the line last season and therefore has more room for improvement. The change in mindset plus the additions to the room will produce a dramatic change, or else starters are going to lose their jobs. DP: Nebraska’s offense won’t be Central Florida-like in Year 1 but the defense has the chance to be one of the most improved in the country. I think there’s that much talent. So when we look back on the season in January, we’ll look at the secondary and say, “Wow, they figured it out.” I see defensive coordinator Erik Chinander and position coach Travis Fisher turning those guys loose and getting some pretty good returns out of it. Who will be the offensive MVP of the team? ES: Stanley Morgan Jr. is the early favorite. Give me Adrian Martinez for Freshman of the Year, though. GS: I really think Adrian Martinez will be just fine right out of the gates. I’ll go with him as the offensive MVP. JP: Stanley Morgan will be the best player on the offense, but unless you have a Jonathan Taylor/Bryce Love type of workhorse in the backfield, the quarterback is always the answer for most valuable player (so long as he is good). I think Adrian Martinez will be good, and with so many weapons in this offense, Martinez is the only one guaranteed to touch the ball every snap. He’s going to orchestrate this offense and his running ability adds another way for him to provide value. DP: If Adrian Martinez has a good freshman season, he’ll need a good running game compliment. Nebraska is going to rotate running backs, yes, but freshman Maurice Washington has a lot to catch up on both physically and playbook-wise. Greg Bell doesn’t need to hit the 1,000-yard mark in 2018 to have a huge impact on offense; he’s going to be important to the Husker offense. BV: Mark me down for Tre Neal. The familiarity he brings with what Erik Chinander hopes to do and his natural leadership qualities make him pivotal for the defense in 2018. ES: If Luke Gifford is as special as I think he can be, I’ll give it to him. Tre Neal has some potential here, too. GS: Luke Gifford. He will be the closest thing to Shaquem Griffin on this year’s Nebraska team. Meaning a guy that can line up in various spots and wreck some havoc provided he stays healthy. JP: See my response above for the team’s leading tackler and refer to Greg’s answer here right above me. I think Ben Stille is one of the best players on this defense, but he’ll be rotating with Carlos Davis who also has the potential to be one of the best. I think Gifford will get as many snaps as he can handle and can make an impact as a pass-rusher, a run-stuffer and even as a coverage linebacker. Tre Neal will be very valuable, but I think Gifford will be more productive and impactful. BV: Ben Stille. I think Nebraska fans are already optimistic about what he brings, but I think he’ll have a good enough season to be a player all of the conference and national outlets are mentioning in next year’s Nebraska previews. ES: Give me Devine Ozigbo. Is that a big surprise? I have no idea, but a big season from him feels like one. GS: Lamar Jackson. He’s got his swag back. Perhaps the staff will start leaving him on an island to shut down a WR, freeing up some more of the defense. JP: I’ll go with Lamar Jackson as well. Travis Fisher seems like a pretty straight shooter based on everything he’s already said, And I don’t think Jackson would be an unquestioned starter unless he has actually earned it throughout camp. He still has to prove that he’s willing and capable of hitting somebody, but I think this defense will also give him more of a chance to actually get up in receivers’ faces and play tight man as opposed to the “let them catch it” defense from last season. OVER/UNDER: Quarterback Adrian Martinez records 2,500 total yards in his debut season. BV: Over, slightly. McKenzie Milton went for 2,141 in his freshman season over 10 games. The Huskers will hope Martinez plays most of 13 games this year. ES: I’ll take the over. Everyone else explains why. GS: Over. 2200 passing and 700 rushing. As I said above, I think he’s going to be good right away. JP: I’ll take the over as well. Martinez is going to be the starter right out of the gates unlike Milton and I think he has a few more weapons than Milton had as a freshman as well. Milton only had 158 rushing yards (sacks included because NCAA) and I’ll take the way over on that. DP: I guess I’ll say over because I think 2,000 yards passing and 500 rushing feels right but it’s not going to be right on the money. OVER/UNDER: Stanley Morgan Jr. hits 1,000 yards receiving in his senior season. BV: Under. Nebraska’s offense would have to pretty explosive given what I assume will be a pretty spread out distribution of catches. ES: I’ll do it. I’ll take the over. I just really want him to, so to heck with the logic everyone else is presenting. GS: Under. There are too many weapons on the team. I do think he gets above his 16.2 yards per catch from last season though. JP: The more thought I’ve put into it, the less likely I think it is. Morgan is going to get a lot of targets, but Tre’Quan Smith got to almost 1200 yards last year because of how explosive he was as a deep threat; that’s not Morgan. Smith actually caught one less pass per game than Morgan did last season. Nebraska isn’t going to force-feed Morgan and JD Spielman like they did last year because of the new weapons, and I’m not familiar enough with Martinez’s accuracy and field vision yet to know how efficient Nebraska’s pass offense is going to be in year one. DP: Under for the same reasons already listed above. A Nebraska running back gets 800 yards rushing in 2018. BV: No. Again, many options, fewer touches for each, but a better yards-per-carry than last year. Far better. ES: I’ll take the under on this one. Sorry, run the ball guy. GS: I don’t see this happening. The best bet would be Greg Bell but I wouldn’t count on that. The rushing attack will be better but varied. JP: This is a tough one. Nobody cracked 500 yards on the ground in 2016 for the Knights and Adrian Killins topped out at 790 last season, leading the team with 122 carries in 12 games. Killins maxed out at 15 carries in a single game last year, but he’s also listed at 5-foot-8 and 158 pounds. Greg Bell is a 6-foot, 200 junior and should be able to carry a bigger load without getting banged up. With Tre Bryant retired, that’s one less mouth to feed. I’ll go with the over, but not by much. DP: See I think I’ll go over here. Bell lands in the 800s. His spring is going to pay serious dividends this season. Nebraska had 14 sacks and 12 turnovers produced in 2017. The 2018 version of the Huskers will have at least 28 sacks and 18 turnovers. BV: No on the sacks, yes on the takeaways. Nebraska’s high takeaways under Riley was 19, and this defense really emphasizes them for whatever that’s worth (all teams are presumably emphasizing getting the ball back). I’m not ready to double Nebraska’s 2017 sack total yet until I see a little more from the defensive line. ES: I’m with Brandon. No on the sacks. Yes on the takeaways. He explains why so I won’t retype the same answer. GS: Yes and yes. There will be a significant difference in the amount of pressure Nebraska is able to create this season. They still don’t have a dominant pass-rusher but they will have more capable players to get after the QB. As a result, more turnovers will occur. JP: I’ll take the over on both. Read what Derek wrote and then pretend I wrote it. DP: Yes and yes. In 2015 Central Florida had 16 sacks and 13 takeaways. In 2016 (Year 1 of Frost), the Knights had 38 sacks and 26 takeaways. I expect a similar culture shift to have the same effect on a defense that isn’t devoid of talent the way last year’s numbers suggest.